This week’s Friday Five from PreppingToSurvive brings you a few articles that underscore our need to discretely prepare for the worst. 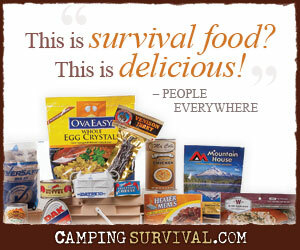 The Bangor Daily News of Maine has an article entitled “Survivalist Congressman is ready for doomsday”. The Congressman, Scientist, and Engineer has a primitive cabin in the hills of West Virginia that he uses as a bug-out-location. From The Bangor Daily News. The world has been replete with large-scale disasters in recent years. From Hurricane Katrina just 7 short years ago to the 600 million Indians losing power a few weeks ago, the world has seen an unprecedented number of events that affect millions of people. According to a new report from former Assistant Secretary for Homeland Defense, America is ill-prepared for another one. Yet another reason to prepare as individuals. From Human Events. Last week it was NOAA that placed an order for a lot of ammo; this week it’s the Social Security Administration. It’s interesting that at a time when buying too much ammunition can land you on a terrorist watch list, the multiple departments of Federal government are ordering large quantities for themselves. From InfoWars and FedBizOpps. Remember the 1st amendment? It’s the one that prohibits Congress from infringing upon our rights by mandating a state-run religion, limiting the freedom of the press, and “abridging the freedom of speech.” Some 220 years later, a former U.S. Marine is being detained and undergoing involuntary psychiatric evaluation for posting anti-government messages on Facebook. From CBS DC. ← Can Morality Be Legislated? Great point, Scrambo. I certainly prioritize my time based on what I believe is important.